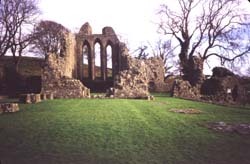 Inch abbey was founded by John de Courcy in recompense for burning down the abbey of Erenagh in 1177. The remaining monks of Erenagh appear to have had this new monastery founded for them in 1180, when they were affiliated to Furness Abbey in Lancashire. It is thought that Furness sent brethren to help build the abbey and provided additional brethren to strengthen the community in 1187, when the erection of essential buildings had been completed. The effective result was the replacement of an Irish community with a largely English one. There had previously been a monastery at Inch, called Inis-Cumhscraigh. It had been established in AD 800, was plundered by the Vikings in 1001, raided by the Irish in 1149 and had become defunct by 1153. In 1177 the surrounding district was conquered by John de Courcy and it is thought that the monastic buildings may have been completely destroyed at this time. The site of the earlier monastery was probably in the area of the parish graveyard, north of the present ruins of Inch Abbey. From the time that the monks arrived from Furness, the monastery remained a centre of strong English influence, refusing to accept Irish men into the community. In 1318 the monks of Inch were accused of hunting Irishmen with spears and singing Vespers in the evening. The abbey church was constructed in the gothic style c. 1200. The presbytery is dominated by lancet windows and the clustered pier in the chapel was far more sophisticated than any that existed in Ireland at that time. After 1400 the church was truncated, the early gothic church was reduced to a singular rectangular chapel and the transepts were cut off by a solid stone screen. The remodeling may have been prompted by the collapse of the tower, and may also have been a practical response to financial hardship. The value of the abbey at the time of the Dissolution is unknown, but it is likely to have been a very small figure. The abbey was suppressed in 1541 and the site was granted to Gerald, earl of Kildare. By the nineteenth century the ruins were badly ruined and overgrown. In 1914 excavation and repairs were carried out and many of the architectural details were restored in cement. The east end of the abbey is now well preserved and there are seven tall lancet windows in the presbytery which date from the gothic period. However, the ruins become progressively sparse towards the west of the church and nothing but the foundations of the nave remain. The walls of the east and south range of the claustral buildings survive to a degree; nothing remains of the west range which may never have been built in stone. In the 1870s a considerable quantity of stained glass exhibiting foliage and animals was found inside the chancery, although there is no trace of animals or figures in the stonework. The ruins are situated on an islet in the Quoile Marshes and are accessible to the public.